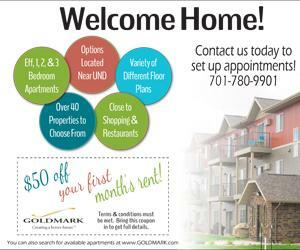 The University of North Dakota men’s basketball team has had a rough last two weeks. 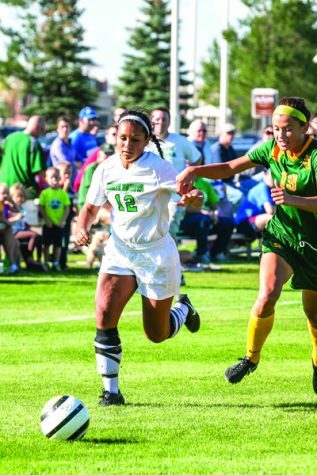 It all started with a heartbreaking home loss to cross-state rivals South Dakota State. If you’re a UND basketball fan, you might not be familiar with the name Mike Daum, but now that UND is a member of the Summit League, it’s time you learn that name. Mike Daum is a 6’9” senior for South Dakota State. He’s the two-time reigning Summit League Men’s Basketball Player of the Year and is likely to win the award for the third straight year this season. Not only is Mike Daum a household name among Summit League basketball fans, but Daum has been making national noise over the course of his incredible four-year career at SDSU. While power-five conference guys like Zion Williamson (Duke University) and Dedric Lawson (Kansas University) have a better chance at earning national player of the year honors than Daum does, don’t count out the South Dakota State senior. Daum is averaging an absurd 24.5 points per game on an extremely efficient 51.9 percent shooting from the field and 38.5 percent shooting from 3-point land to go along with 11.1 rebounds. To put it simply, the dude is an absolute monster. This might seem like a long intro for a guy that doesn’t play for the Fighting Hawks, but with the way Daum played against UND on January 16 at the Betty Engelstad Sioux Center, it’s important to have some background as to who he is. Against UND, Daum recorded a monstrous 34 points on 14-of-24 shooting from the field to go along with a career-high 21 rebounds leading the Jackrabbits to a hard-fought 78-74 win over the Fighting Hawks. UND wasn’t without some nice individual performances of their own, though. Marlon Stewart and Cortez Seales combined for 37 points on 15-of-30 shooting from the field to go along with 12 assists and eight rebounds. Filip Rebraca also gave the Hawks a nice spark off the bench, scoring 15 points on 7-of-9 shooting from the field. Despite getting nice games from Stewart, Seales and Rebraca, Mike Daum and Co. were too much for UND to handle. This loss would jumpstart a tough stretch of games for the Fighting Hawks. 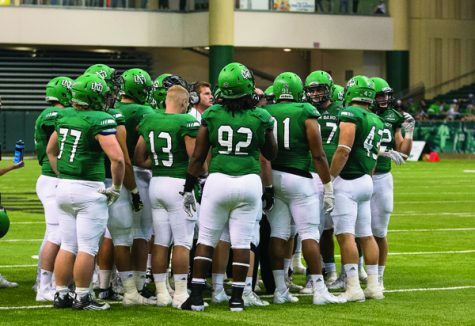 After the tough loss against South Dakota State, UND hit the road for a short road trip down to Fargo to take on in-state rivals North Dakota State. 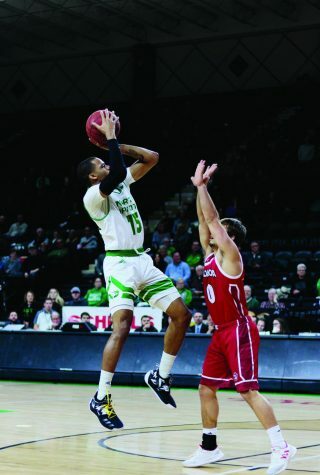 Unlike the game against the Jackrabbits, Marlon Stewart and Cortez Seales did not shoot the ball well against the Bison. Stewart and Seales combined for 21 points on a rough 6-of-28 shooting from the field and 2-of-9 shooting from three-point territory. 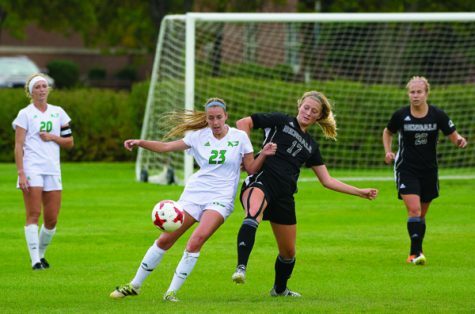 Despite the rough statistics, UND still fought hard and put themselves in a position to win the game. 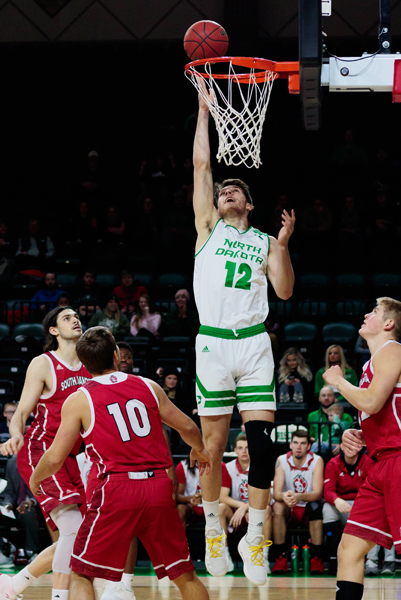 After UND forward Conner Avants got a steal with 20 seconds left, the Fighting Hawks would have the ball down two points with a chance to either win or tie. After a UND timeout, Marlon Stewart missed a long jumper with six seconds left. 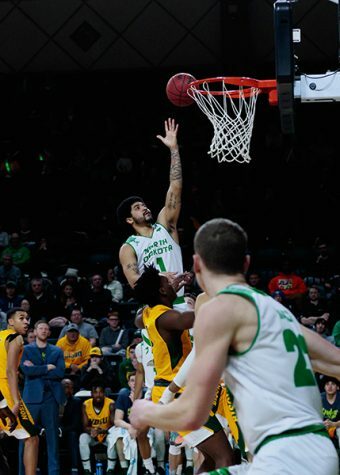 Second and third attempts from Avants and Aanen Moody wouldn’t fall, either, giving NDSU the 67-65 win in an intense battle between two rivals. After the game in Fargo, UND would continue to struggle, losing their next game to South Dakota with a final score of 70-56. The Fighting Hawks are now riding out a three-game losing streak and have lost eight of their last 10 games putting them in eighth place in the Summit League. 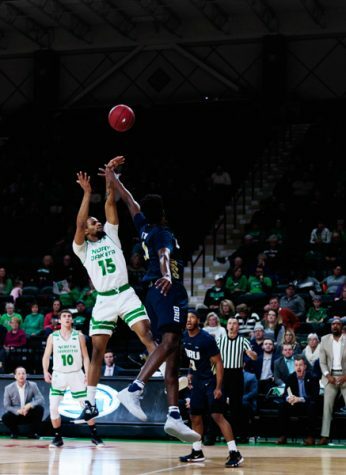 North Dakota will look to get back on track this week when they play the Western Illinois Leathernecks and the Omaha Mavericks.